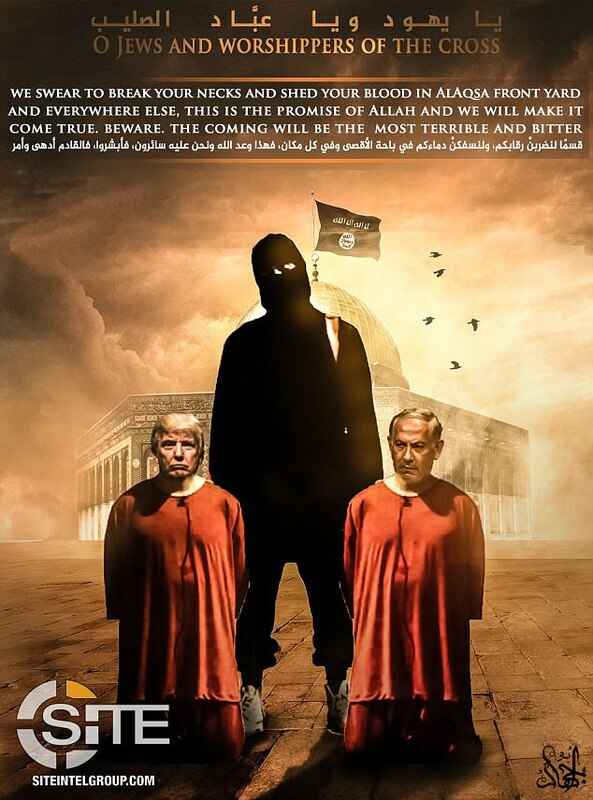 ISIS swears to break Trump & Netanyahu’s necks & shed their blood…. 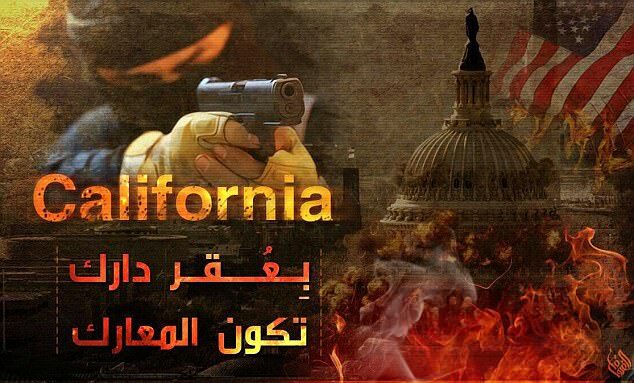 ISIS fanatics have threatened to carry out lone wolf attacks on America in chilling new propaganda circulating online. Whatever you may think of them, they cannot be accused of lacking in enthusiasm for the cause. In one poster, US President Donald Trump and Israel‘s leader Benjamin Netanyahu can be seen dressed as prisoners and kneeling before a jihadist executioner in front of the Al-Aqsa mosque in Jerusalem. Jordan’s King Abdullah II on Wednesday decried last week’s decision by U.S. President Donald Trump to recognize Jerusalem as Israel’s capital, warning the move would adversely affect peace and stability in the region. “The U.S. move is really dangerous. We are sure it will affect both peace and stability,” the king said in an address delivered at Wednesday’s Organization of Islamic Cooperation (OIC) summit in Istanbul. “Decisions made on Jerusalem are very dangerous and will impact the rights of the Palestinian people,” he said. Good. About time this fraud comes to an end. There are no “Palestinian people” and the Arabs have to find another jihad. Israel is not for sale. Won’t happen. The online images emerged after a taxi driver attempted to detonate a pipe bomb a the Port Authority Bus Station subway station in New York yesterday. While initial reports suggested the crude pipe bomb, made from a pipe, a 9-volt battery, match heads, sugar, Christmas tree lights and screws, had detonated prematurely, suspect Akayed Ullah, 27, told investigators he set off the bomb deliberately. This took place just days after Donald Trump recognised Jerusalem as Israel’s capital, sparking violence between Israelis and Palestinians in the Gaza Strip. They also show the Manhattan skyline and the aftermath of a truck attack in October in which a rented vehicle ploughed into cyclists and runners for about a mile along the Hudson River Park’s bike path killing eight and injuring eleven others. The picture of Trump kneeling with Netanyahu is set before the Al-Aqsa mosque compound – a flashpoint holy site in Jerusalem. 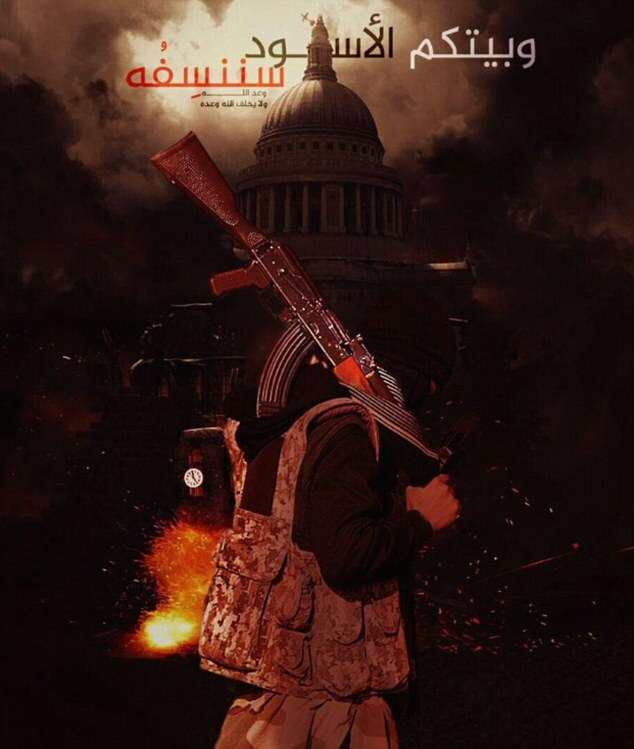 A black and white ISIS flag can be seen flying from the top of the building while a jihadist dressed in black stands in front of the two leaders. Ullah, who was arrested and taken for questioning after the bomb only partially detonated, told police he was walking through the underground tunnel at 7.20am, between the Port Authority station towards Times Square, when he saw the Christmas-themed posters on the wall, which reminded him of ISIS’ calls last month for militants and lone wolves to attack holiday markets. ‘He acknowledges he purposely set it off then and there,’ a senior law enforcement official told the New York Post. The Bangladeshi immigrant added that he was specifically inspired by ISIS, ‘not Al Qaeda’.